In this video by Youtube user, "Teresed News" (a service of SocialShare.com), Marco Rubio is remixed to the beat of the popular "Harlem Shake". After the State of the Union on Tuesday, Marco Rubio was selected by the Republican party to represent their view of The State of the Union. 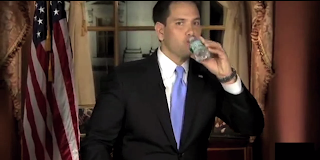 In the middle of his speech, Rubio needed to pause and take a drink. Within minutes, Twitter was abuzz with comments of Rubio stopping to take a drink in the middle of his speech with hashtags like "#rubiowater" and "#waterbreak". The "Harlem Shake" has taken the web abuzz as the new "Gangnam Style", with videos popping up everywhere of others' renditions of the song. The videos usually start with one person casually dancing and people behind him or her doing business as usual. Then, at the climax of the song, everything goes wrong. You can see other Harlem shake videos here.